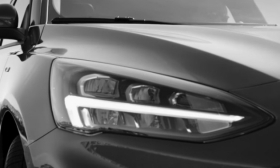 An image from Ford's video shows the new Focus has daytime running lights that cut through the middle of the headlamp unit. Ford teased its latest-generation Focus ahead of the compact car's global unveiling in Europe and China next week. Ford released a video on its European web site showing details of the Focus hatchback that will be sold in the region. The video highlighted some of the more upscale features of the car, including daytime running lights that cut through the middle of the headlamp unit, model lettering that runs across the tailgate, and a sculpted hood that meets a prominent black grille. A spy shot of an uncovered prototype car published earlier this year showed the new model has more pronounced rear wheel arches, giving it a sporty look more associated with rear-wheel-drive coupes. The new Focus will offer distinct model lines that give greater visual differentiation than traditional trim levels, Ford's head of global markets, Jim Farley, told the Deutsche Bank Global Auto Industry Conference in January, in the same way it created distinct versions of the new Fiesta. Focus variants will include a sporty-looking ST-Line, an SUV-inspired Active variant and an upscale Vignale version. An ST performance version will also be offered. Farley said the Focus would be more upscale than the current car. He also predicted fewer sales for the car as Ford targets higher margin sales to boost profitability. 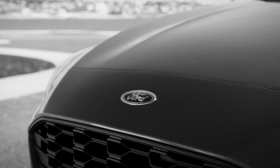 Ford's video shows a sculpted hood and prominent black grille. 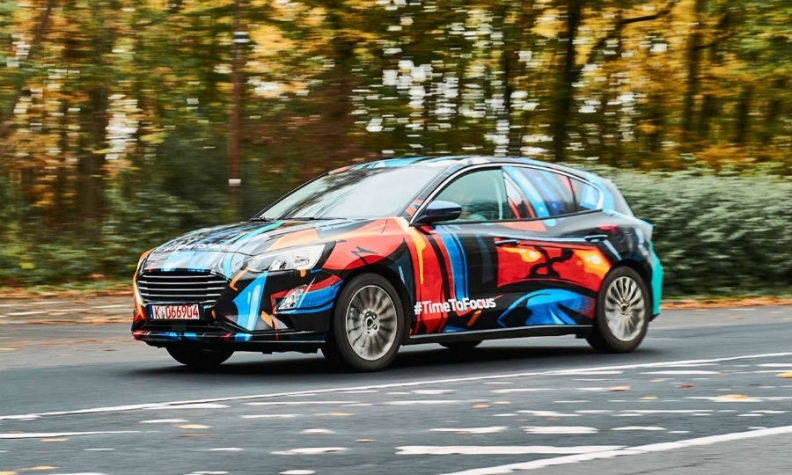 Ford will unveil the Focus on Tuesday, April 10 simultaneously in London and in Shanghai. The hatchback will be shown in London, likely alongside the station wagon version, while the sedan will be revealed in Shanghai. Ford is expected to show the new model lines at the London event. European versions of the Focus will continue to be built in Ford's plant in Saarlouis, Germany, which has had a $600 million (490 million euro) refit to build the new model. The U.S. market will get Focus sedans built in China starting in the second half of 2019. Ford said the production shift to China would save the company $500 million in tooling costs. All versions of the new Focus were designed and engineered at Ford's technical center in Cologne, Germany. Ford released a Focus prototype picture in December. The Focus is Ford's No. 2 best-seller in Europe after the Fiesta. European sales of the Focus were flat at 212,806 last year, according to JATO Dynamics market researchers. Fiesta sales fell 15 percent to 254,059. The Focus was Europe's fourth best-selling mainstream compact car in 2017, after the Volkswagen Golf, Skoda Octavia and Opel/Vauxhall Astra.